Having kept up with author Alan Zadoff’s The Unknown Assassin trilogy from the very beginning, I was interested in getting to finally see how Boy Nobody’s—or, Zach—story would finally wrap up. 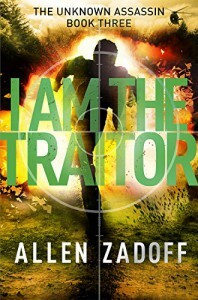 Considering the unending action that filled I Am The Traitor’s predecessors, I was excited to delve into a novel that would offer a brand new story that would ultimately make or break the series. In I Am The Traitor, we are reintroduced to Boy Nobody’s world full of espionage, betrayal, and secrets. His doubts toward the Program are made plain and he has no problem with bringing them down. But Zach’s defiance brings about a whole new problem when he discovers that his old friend and ally, Howard, is in trouble. Forced to look back to his past assignments, Zach is reconnected with past connections, as well as introduced to brand new faces who have also been affected by the Program. What Boy Nobody doesn’t anticipate is that you might not be able to let anybody too close and that the Program, no matter how hard he might fight to escape it, will never be too far behind. Right off the bat I can say that, like the novels that came before it, I Am The Traitor is filled with action sequences and other badass goodness. I felt right at home reading fight sequences that flowed naturally, watching as Boy Nobody battled against his typical antagonists, and reading about the conflicts that have plagued him in every novel of the trilogy. Like always, if you are a fan of action then The Unknown Assassin trilogy is for you. What accompanies the fast-paced action scenes is a thrilling atmosphere that cannot be ignored and leaves readers on the edge of their seats. Zadoff’s writing creates a unique world where readers can experience the life of an assassin and realize that it certainly isn’t what it’s cracked up to be. Zadoff’s prose is simplistic and allows for a quick read. While I do wish that there were more instances where descriptors could have been provided, it was easy to establish an idea of the scene in my mind while reading. However, I will admit that while all of the fighting was awesome, there was no denying the fact that the plot of the novel began to feel a lot like the same old same old. In previous novels, Zach/Boy Nobody has been given an assignment, typically involving a teenage girl, whom he gets close to and inevitably has sexual relations with the girl, before finishing his assignment off and moving on to whatever the Program has given him next. While Zach is far from pro-Program in this novel, I did feel like the same song and dance was being repeated in I Am The Traitor. If you’ve read the novel, you know what I’m talking about—and if you haven’t and are about to, you will find out. I certainly wasn’t underwhelmed by I Am The Traitor, but I wasn’t blown away either. I’m a firm believer that the final novel in a trilogy should be definitive of the entire series, and that it should leave the reader with an experience that they’ve never had before. I would recommend The Unknown Assassin trilogy to any readers who are big fans of spy thrillers a la the Bourne movies. Any readers who are looking for an interesting, thrilling read should also give The Unknown Assassin novels a read. Lastly, any readers who are fans of novels that feature major character development across a series should definitely give it a try.